The two-hook flapper follows the traditional monofilament paternoster design, which can be constructed with one, two or even three hooks. For big fish or rough ground, one hook is the logical choice while for small fish taken over clear ground three hooks offer better odds of successful fishing. Two hooks are a popular compromise and very often the choice of the freelance angler for runof- the-mill venues and also mixed species fishing. The term flapper refers to the fact that the hook snoods hang loose and flap during the cast, so obviously, it is not the rig to choose if you need to fish a long-range. When distance is a priority clip down the bait close to the main trace line. We have shown you how to do this in earlier rig building sequences in this series. For uncomplicated short and middle range casting from piers and beaches and for a host of species, the two-hook flapper is hard to beat. 4. 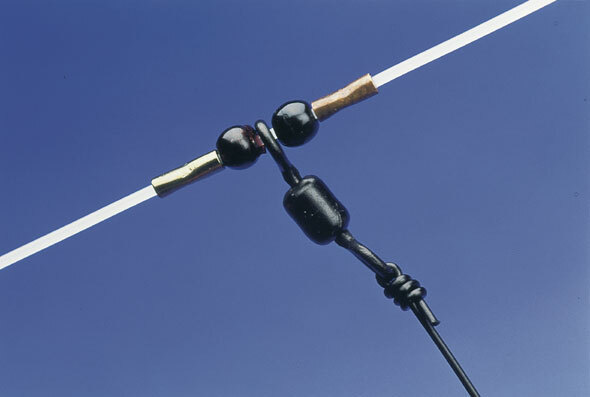 Position the 45lb swivels with beads and crimps either side along the length of the rig body and secure in place by lightly crushing the crimps with crimping pliers. Pinched lightly they can be adjusted to suit hook snood positions. 5. 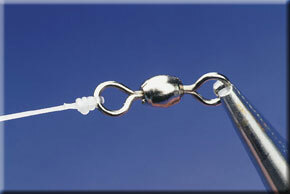 Now tie the hook snoods on the swivels using a three-turn Grinner knot. Snood lengths, usually between 12in and 20in long, are critical in relation to the swivel spacing on the rig’s mainline. Do not allow the hooks to overlap the snood or link above or below because they will tangle. ● The rig’s overall length can be varied to suit particular venues, conditions or species. A short, stubby 3ft long rig is ideal for fi shing from high piers or rock marks because it puts bait closer to the sea bed. 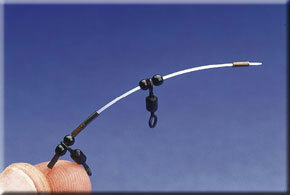 A short rig with short snoods can also be cast further. 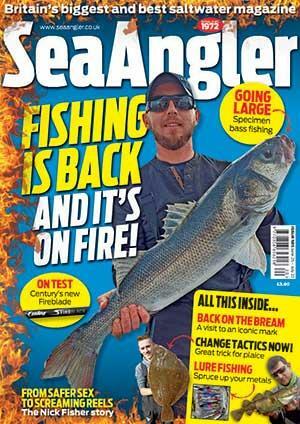 ● Longer 5ft-plus rigs spread hook baits over a wider area and are the ideal choice for surf or estuary fi shing. In surf a longer rig increases the chances of placing bait where the surf gouges the sand and marine life, a notorious hot spot. ● Longer snoods are usually favoured for some shy-biting species, but if they are used remember to extend the overall length of the rig body. ● If fi shing at short range from high venues like piers, the top hook is likely to be lifted off the bottom by the angle of the mainline. Make the top snood slightly longer than the bottom snood to allow for this. ● Beads or sequins are optional attractors on the hook snoods and can be held in position by adding a bait stop above them. Make these from 1cm length of silicon sleeving. Pass the line through the sleeve twice and then pull the line tight to form the stopping device. ● Snood line breaking strain depends on what the rig is being used for. In general 25lb is the choice in winter because it can cope with the teeth of small fi sh.